Creating a Deaf and hearing theatre ensemble in New Zealand. I write this blog post after sitting down for the first time to reflect upon Equal Voices Art’s latest performance project, ‘At The End Of My Hands’. It opened at the beginning of May to full audiences in Hamilton, New Zealand, and is currently in preparation to go to Auckland at the end of May. What a whirlwind adventure the process has been! I arrived in New Zealand 15 months ago to start teaching theatre studies at the University of Waikato. I don’t have a traditional background in theatre, but trained as a physiotherapist, whilst working as a performer in a professional Deaf-led dance theatre company. Consequently, the body, how we move, how we communicate and how we share what it is like to be a human being with other human beings (a concern of theatre I make! ), are all primary concerns of mine. I wanted to make a show with Deaf actors and hearing actors, and work on developing an aesthetic of manual languages fused with voice, gesture, physical storytelling and visual vernacular. Deaf actors inherently understand what it means to work through the body and to place the body at the centre of the work. 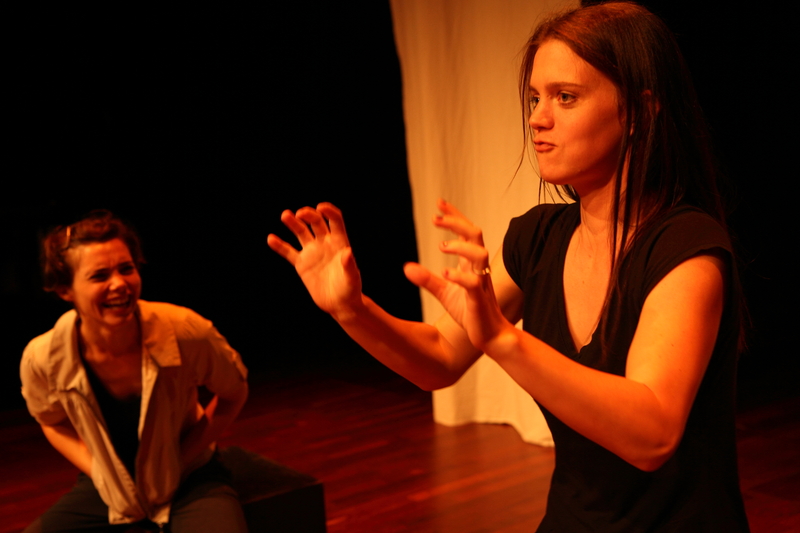 Inclusive theatre is still emerging in New Zealand, and I couldn’t find any current professional activity of Deaf actors or performances designed for Deaf and hearing audiences, so finding a starting place was key. This starting place came in the shape of Kayte Shaw, a community development Kaituitui (Kaituitui: Maori word for creating links, and connecting people) working for the wonderful organisation Deaf Aotearoa. As a hearing person from overseas, I needed to tread carefully and sensitively. I am not new to Deaf culture, having worked within Deaf-led theatre for my formative years, but I was new to Deaf culture here in New Zealand, and needed to show my respect to that community by making connections slowly. Kayte enabled me to offer introductory sign theatre workshops to the Deaf community in Waikato. We recorded videos for the Deaf community so all the information was in their first language (New Zealand Sign Language) and Kayte worked hard to get the news out to everyone who may be interested. We booked an NZSL interpreter to support me in delivering the sessions as I sign in BSL (British Sign Language), and am new to the unique manual language that is NZSL. The languages have similarities (BSL, NZSL and AUSLAN all belong to the same family of sign languages), but there are specific cultural and linguistic differences that make NZSL unique. The workshops enabled us to build a shared physical language for ways of working, starting points for telling stories, and choreographic improvisations. The workshops allowed us to see which ‘theatre specific signs’ weren’t familiar to the group, and to attempt to find ways to explain the concepts behind such signs. From the workshops came the auditions. We were looking for four Deaf actors and two hearing actors (who were familiar with Deaf culture and physically strong storytellers). The final ensemble consisted of 4 Deaf actors who have NZSL as their first language, 1 hearing actor with Serbian as his first language and 1 hearing actor who was familiar with sign language and Deaf culture and had attended the sign theatre workshops. We also booked an experienced interpreter, Kelly Hodgins (who has interpreted for stage shows), for the rehearsal process. Alongside Kelly, we also worked with Nicola Clements, who has theatre experience and is training to be a NZSL interpreter. There is very little work like this going on in New Zealand, so it was an experiment for all concerned. Nicola helped us to make the connections I needed to make the working process a reality. Beginning a devising process which crosses cultures and languages needs to find a starting point where all can move from, so we started by telling stories. Stories about communication, culture, making friends, Deaf culture, the oppression of Sign Languages (three of our Deaf actors were banned from using sign language in school in the dark days of oralism) were all explored and told, without words and signs at first – just using our bodies. Signs and words followed, as did visual vernacular, gestural storytelling and universal modes of expression. ‘At the end of my hands’, Equal Voices Arts. Photo: Sycamore Media. The piece emerged quickly and strongly. These were stories that needed to be told, and they jumped from people’s hands and bodies. There was an immediacy and urgency to set them free. Not all the performance is signed, and very little is spoken. All that is spoken is not interpreted into sign and all that is signed is not interpreted into spoken English. Instead, the two languages sit side by side, explored equally (and given equal status), but not in parallel. The Deaf audience get a slightly different narrative to the hearing audience, and this is deliberate. Most of the Deaf audience know these stories, they know sign languages worldwide were banned, they know what that oppression has done to the development of the language and cultures in the Deaf communities worldwide. For most of our hearing audience, these stories were new, and shocking. And watching alongside a Deaf audience changes their perceptions hugely. The feedback from the sell-out Hamilton shows was hugely supportive, warm and affirmative of the stories shared. The piece is looking forward to going to Auckland next, where it will be performed on the 30th May at TAPAC (The Auckland Performing Arts Centre). This project was funded by the Contestable Research Fund from the Faculty or Arts and Social Sciences at the University of Waikato and supported by Deaf Aotearoa. Equal Voices are grateful to Kaite O’Reilly for mentorship and guidance throughout. Dr.Laura Haughey is a theatre director, movement director and actor trainer with an interest in the body and communication. She moved to New Zealand in 2014 to teach theatre at the University of Waikato. Laura runs Equal Voices Arts ( http://www.equalvoices.co.uk), delivering projects in both the UK and NZ. Copyright Laura Haughey May 2015. 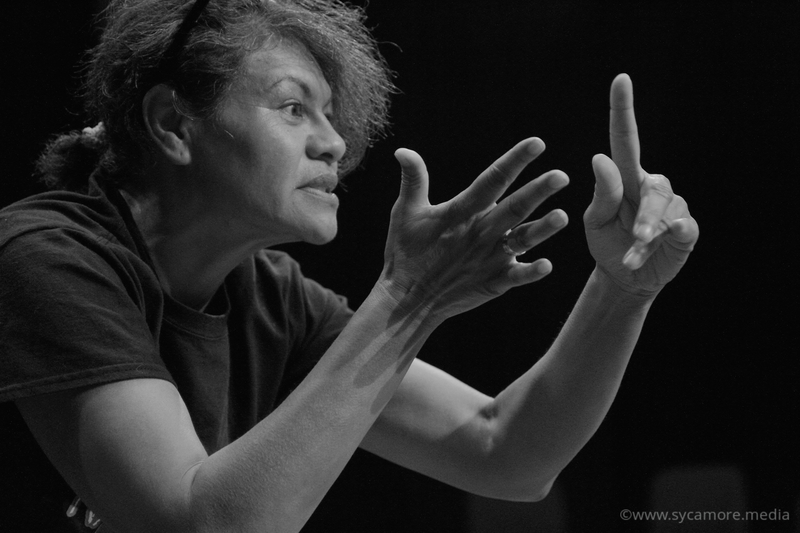 British Sign Language (BSL) creative consultant and performer Jean St Clair has been a close friend and collaborator for a dozen years. 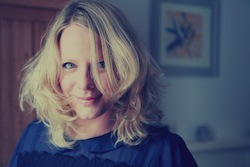 She has worked with me on many productions – advising on translation/reinvention from spoken/written language into visual language with National Theatre Wales (‘In Water I’m Weightless’, 2012), Graeae (‘peeling’ 2002) and now for a second time with Forest Forge Theatre company (‘peeling’ 2011, ‘Woman of Flowers’ 2014). We have also collaborated on our own production with Jeni Draper as The Fingersmths Ltd in 2006. I have been working again recently with Jean on Woman of Flowers, my latest script and a reinvention of the Bloudewydd myth from The Mabinogion for Forest Forge Theatre Company. 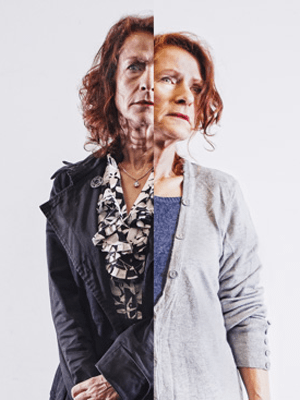 We are in the final stages of rehearsals before a national tour 18 Sept – 1st Nov, and of course Jean has been involved, as central to the production in aesthetic and concept are sections of theatricalised sign and visual language. Jean in poster design for ‘Frozen’ by Bryony Lavery, Fingersmiths last production. I trained with British Theatre of the Deaf, run by Pat Keysell. She was trained in Mime so the language we conveyed was called Sign Mime. A combination of mime and stylised signs. It was not the everyday language deaf people were using. It was pretty much the same when I worked with National Theatre of the Deaf in USA where the ASL (American Sign Language) on stage was delivered in a poetic style. When I did ‘Hearing’ at Birmingham Repertory Theatre, a play with all hearing cast, the language I used was the natural language of BSL. It was the same when I did Children of a Lesser God (nb. Jean toured internationally and to London’s West End in this groundbreaking play). When fingersmiths was set up by Kaite O’Reilly, Jeni Draper and myself, we were looking into “Equality in both languages, English and BSL”. It was where we experimented with a variety of styles such as where Jeni would speak English and I would sign BSL but independently of each other as opposed to have Jeni interpreting for me. One style was Visual Vernacular (V.V.) which was not based on English. It came from the concept of looking at the world in a visual way and to capture the images by using facial expressions, hand movements and body language without using either English or BSL. There are some iconic signs such as plane, bird and baby which we could incorporate in V.V. – Can you explain the difference between eg sign interpreted performances, theatricalised BSL, sign performance and visual language? Sign interpreted performances is where a Sign Language interpreter standing at the side of the stage signs what is being spoken on stage or it could be integrated in the performances. Theatricalised BSL is based on BSL but taking on the visuality and expanding on it. Visual Vernacular is independent of English and BSL, apart from using iconic BSL signs. If you look up the dictionary for ‘Vernacular’, it will come up with ‘A vernacular or vernacular language is the native language or native dialect of a specific population, especially as distinguished from a literary, national or standard language, or a lingua franca used in the region or state inhabited by that population.’ Visual Vernacular can be used world wide, it does not matter which sign language you use, BSL, ASL, or Japan Sign Language, the V.V. is invariably similar due to the way it is presented visually. When you are working with English text, what is your process when transforming that into a) BSL and then b) visual language? Both are slightly different. But the basic rule is to understand the text, the meaning, and also to explore whether there is an underlying meaning ‘between the lines’ or whether it is presented in an ambiguous way, then the BSL would need to reflect this. There is no point in signing word for word otherwise the meaning will be lost. For example if one say, ‘you bring sunshine to my life’. We don’t actually use the sign for ‘sunshine’ in that context but to find the interpretation in a sense that we bring sunshine in that person’s life by finding different signs to match the meaning. When you are devising yourself – maybe using V.V. can you describe your process? As V.V. is not ‘language-based’, the process is much more free. 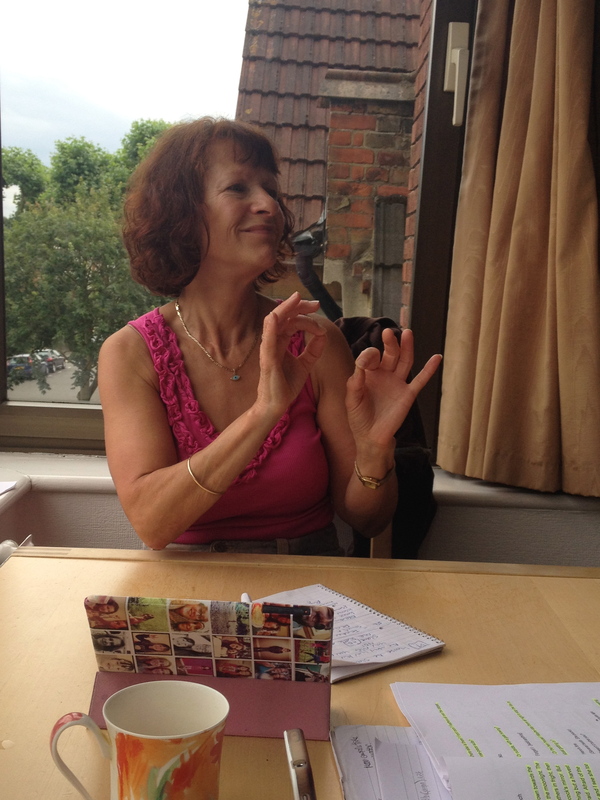 You look at the world within and find iconic BSL signs, gestures, facial expressions and movement to match the context. For example if I am to describe walking along the high road, I would describe the buildings, people walking past and to add human behaviour, little things that people may not notice but it is there. One way to use a comparison to V.V. is to watch cartoons, the set up is similar. Wide, medium and close up shots of particular objects or a bird. For the close up, I would describe or act like a bird with facial expression, with the medium close up, I would use my arms to move like wings and for the wide shot, I would use my hand to show the bird flying away into nothingness. Further discussion of Jean St Clair’s process will follow in a later post.